If top quality and commercial yields are what you seek, then this F-1 hybrid of Reeferman's NL #5 and Blueberry Indica is the perfect strain for you. 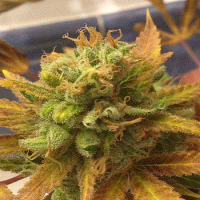 Blueberry Blast Regular Cannabis Seeds by Reeferman Seeds: If top quality and commercial yields are what you seek, then this F-1 hybrid of Reeferman's NL #5 and Blueberry Indica is the perfect strain for you. Careful parent selection have made this the very best of Blueberry hybrids. Smells range from sweet blueberry pie and sometimes blueberry/mango. 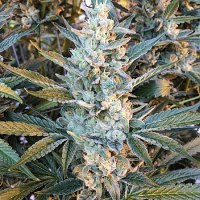 Blueberry Blast has a 7 to 8 week flowering time and high yields indoors and outdoors, where the plants have produced up to 3 lbs of quality flowers by late September. This plants yield is affected by Root mass so the more soil she has for her roots to grow, the more lovely flowers she will produce.